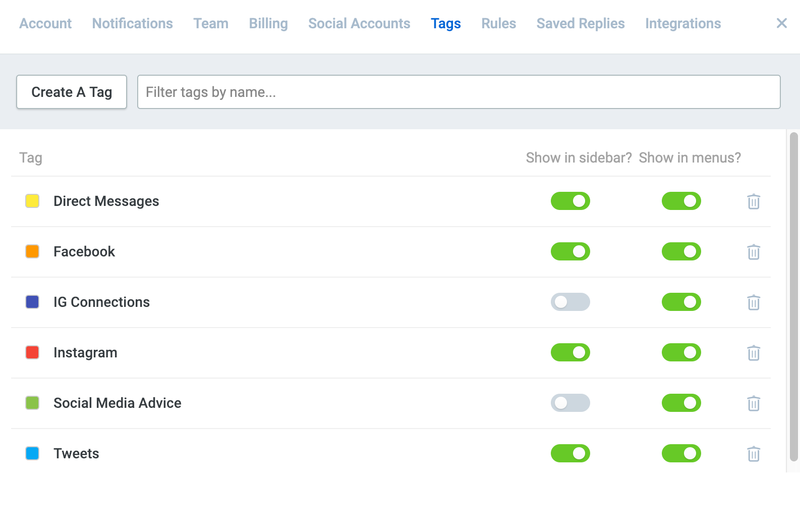 Reporting Adding tags to conversations allows you to track how many conversations you received about a specific issue or topic. Learn more about the Overview Report here. Organization If you have team members who respond to specific conversations, for example, based on the type of message or the social account, using tags is a great way to create "buckets" for each team to focus on. Learn more about routing conversations to folders here. Prioritization Maybe you have a dedicated team member who triages your Team Inbox throughout the day. They could add a "Priority" tag to conversations that need an urgent reply, allowing the rest of the team to tackle those conversations first. Follow ups Perhaps your product experiences a temporary outage or critical bug. Your team could add a "Bug-XYZ" tag to related conversations so you can easily follow up with users once the issue has been fixed. At Buffer, we also add the date to the end of tags, which helps with maintenance later on when we're clearing out older tags. Only team members with the Admin role are able to create new tags. When new tags are created, they'll also be displayed on the left hand side of your dashboard as custom folders. You can choose not to use a tag as a custom folder if you wish. A scenario in which you might not want a tag to also act as a custom folder, might be if you're purely using the tag for reporting purposes. You can also choose to disable tags from being shown in menus. This would apply to any of the Tags menus you see throughout Reply. A scenario in which you might wish to do this would be if you were using a tag to track a specific bug, which has now been resolved. Removing the tag from menus means no further conversations will have that tag applied. To get started, click Settings on the left hand side of your dashboard and then select the Tags tab. Give your tag a name and then hit enter/return to save it. Once your tag has been saved, click the small box to the left of it to choose a color. This is not mandatory, but can be helpful for visually distinguishing your tags when they're shown as custom folders on the left hand side of your dashboard. To add a tag to a single conversation, click on the Tag menu above the composer box when viewing a conversation, and select the tag you'd like to use. It's worth noting that you also have the option to Move the conversation. Tagging a conversation will mean it appears in the custom folder, in addition to its original location (for example, the Team Inbox), whereas moving a conversation will fully move it to the new location. 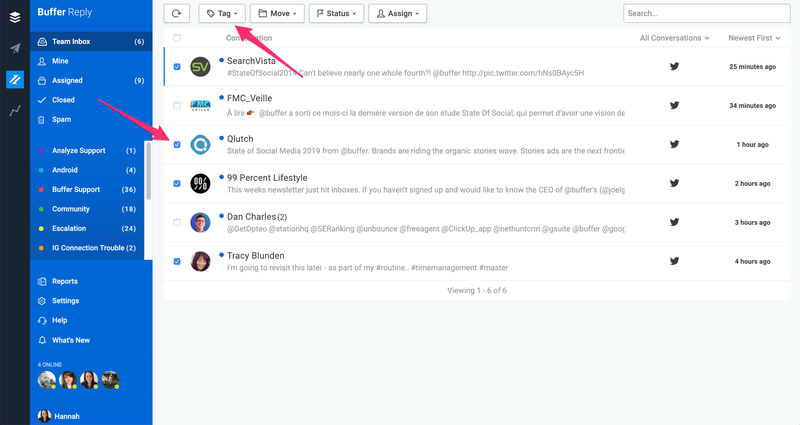 To add tags to conversations in bulk, tick the checkboxes to the left of the conversations you'd like to tag, either in the Team Inbox, Mine folder, or Assigned folder, and then click on the Tag drop down and select the tag you'd like to use. 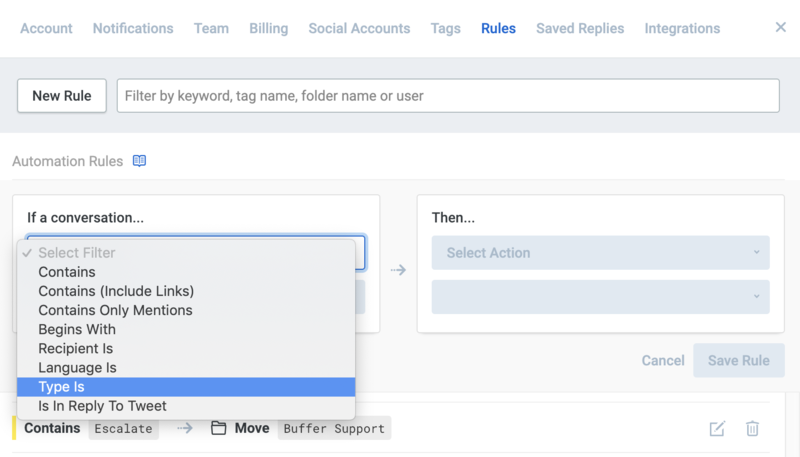 As well as being able to manually add tags to conversations, you can also set up Automation Rules to have this happen automatically based on certain criteria, for example keywords or language. Learn more about Automation Rules here. By default, all new conversations (of any type) will land in your Team Inbox. This works great for smaller teams, where all team members are responding to all conversations. However, if you have specific team members who takes care of certain types of conversations, it might be more efficient for them to work out of dedicated custom folder instead of the Team Inbox. This can be achieved by using a combination of tags and Automation Rules. Maybe you have some team members responding to public conversations, and other team members responding to private conversions. You could have a "Public" folder (for your Tweets, Facebook comments, and Instagram comments), and a "Private" folder (for your Twitter Direct Messages, and Facebook messages). Let's say you're managing two different brands (we'll call them Brand A and Brand B). You might have some team members looking after Brand A, and other team members looking after Brand B. You could have a "Brand A" folder and a "Brand B" folder. Or, you could break it down further and have "Brand A Twitter", "Brand A Facebook", "Brand A Instagram", "Brand B Twitter", "Brand B Facebook", "Brand B Instagram". Maybe you offer support in three different languages and each team member specialises in a particular one. You could have a folder for each language, allowing team members to easily access the conversations they need to respond to. 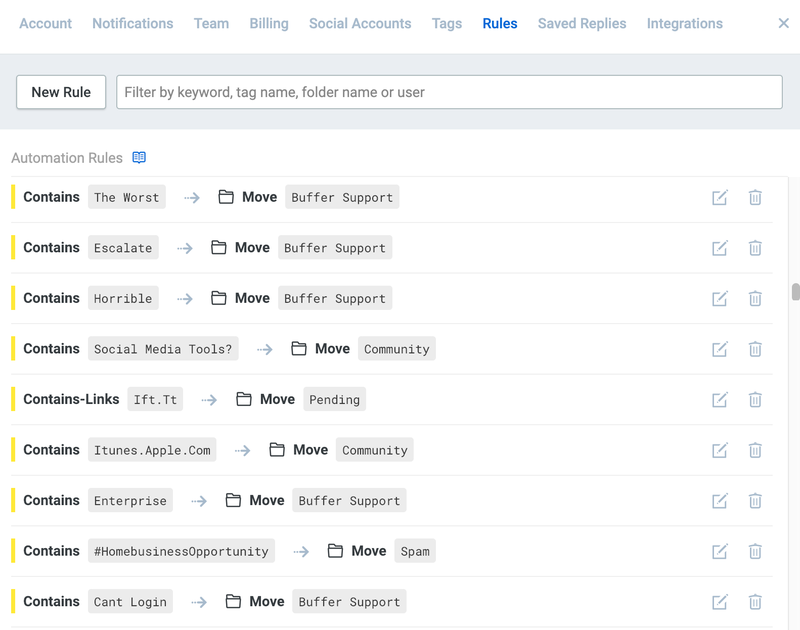 The first step is to create the tags that will act as your custom folders, following the steps above. The second step is to create the Automation Rules to route your conversations to the right custom folders. Still in the Settings area, select the Rules tab. From there, click New Rule. Choose the appropriate filter from the drop down list. For example, if you were creating folders based on the message type, you'd choose the Type Is Filter, whereas if you were creating folders based on language, you'd choose the Language Is Filter. Next, choose the Move To Action and select the appropriate folder. You can then repeat the same steps to create as many custom folders and Automation Rules as you need!